From within the darkest depths of the Milky Way galaxy, a strange new world has been discovered: Space World. Galactic Pinball has four space-themed tables: Cosmic, Colony, UFO and Alien, each with its own gimmick that provides a high score. Collect star marks to enter the bonus stage and hit stars with the pinball for a bonus. As a pilot in the Space Federation, you are investigating the mysteries of the galaxy. Destroy the three small planets to activate Kick Back. Fire the pinball into the Planet Hall several times to play a bonus stage. Destroy the Bumpers within the time limit to activate a special bonus game where you help Samus Aran take on the Space Pirates. A large, deep-space colony is adrift in space. When the asteroids approach, use the rescue ship to shoot and destroy them. Clear the five targets around the board to activate a bonus. The Evil Skeleton lives in this area of space. Speed mark bumpers can make your puck go faster. Pass the pinball through the lanes and hit the bonus bumpers to make the Evil Skeleton appear. Hit the pinball into his mouth to defeat him. The terrible alien forces are in hiding. Enter the alien dome to lure the aliens out, and hit them to destroy them. Hit the transformation bumpers to turn yourself into an alien. 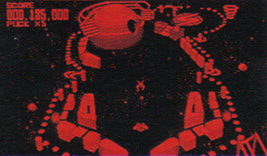 On the Cosmic table, destroy all of the bumpers during Bumper Clash and the Screw Ball symbol from Metroid will appear. Hit it and the music will change to the Metroid theme. 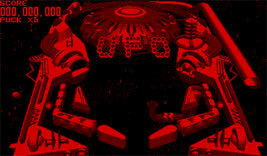 You control Samus's ship, and have to shoot down Zebesian creatures.